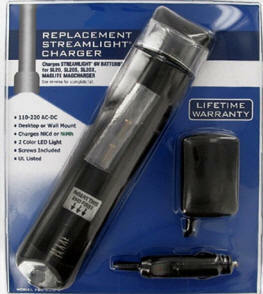 FBC-NCD-4 : AC & DC Charger for Streamlight SL-20 battery (the 7.5" long battery). Can be mounted on wall. Power supply plugs into AC wall outlet. DC power cord plugs into 12VDC vehicle socket. Charges the following battery models: ET2600D, SL-20, SL20S, SL20X, 20170, 20X1701, 41B038AF00101, 40070149, MA5, ML500, ML5000. Charges battery that fits Streamlight SL-20, Streamlight SL-20S, Streamlight SL-20X, Streamlight 20170, Streamlight 20X1701, Streamlight 40070419, Streamlight RX1019, Streamlight 41B038AF00101, Mini Stinger, Maglite 9032, Maglite ARXX0075, Maglite MA5, Maglite ML500, Maglite ML5000, Maglite RX1019, GE 40070149, GE 41B038AF00101. SL-20 : 6.0 volt 2500mAh rechargeable Heavy-Duty Ni-Cd rechargeable battery stick for Streamlight & Maglight flashlights. Replaces SL20, SL-20, FLB-NCD-4, etc. Size: 7.25" long x 1" diameter.